Off to Gretna Green and a giveaway! Do you just love those scenes in Jane Austen fanfiction where a couple we care about elopes to Gretna Green? Whether it’s Darcy and Elizabeth or some other couple we are rooting for, it seems so romantic to picture them rushing off to be married. Of course, we also cringe when a naughty couple such as Wickham and (fill in the blank) do the same. Still, I love to read about Gretna Green, and I thought I would share just a little about this life-changing village in Scotland and why it became legendary. 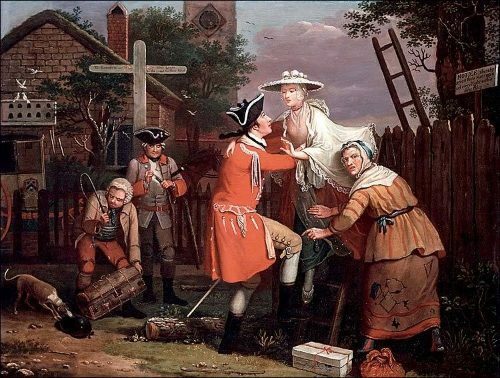 The reason for the exodus to Gretna Green was the Marriage Act of 1753—Lord Chancellor Hardwicke’s Act for the Prevention of Clandestine Marriages. The law passed after a good deal of debate about regularizing marriages to protect wealthy families from having their offspring preyed upon. Prior to this, London was infamous for “Fleet marriages” performed by clergymen who were in Fleet Prison for debtors. Clergymen could live in the “Rules” area, just outside the prison (meant to provide them a sanctuary) and there they performed questionable marriages. They could not be fined for performing these marriages and were effectively beyond the law. The Fleet weddings were the bane of many a rich family. Underage heiresses were tricked or kidnapped and forced into marriages by unscrupulous men. Fathers also complained of sons who had married unsuitable brides. Even two dukes saw their sons married in these secret ceremonies. However with the Marriage Act, by 1754 the informal wedding had been swept away. Under the act, clandestine or common-law marriages in England were made illegal. Now marriages required an official ceremony performed by a Church of England priest, unless the couple was Jewish or Quaker. The groom and bride had to each be 21 years of age, or have the consent of their parents or guardians. The wedding had to take place during daylight hours in a parish church within the Church of England’s jurisdiction. Banns had to be read for three Sundays prior to the ceremony, and the curate would ask if anyone knew any reason why either the man or woman could not marry. If the couple lived in separate parishes, the banns had to be called in each. Lastly, a license had to be obtained and the marriage recorded in the parish church. and the names of those to be married had to be written on the license. These constraints did not help those wishing to marry against the wishes of their families. By requiring parental consent, the act gave parents the right to reject any marriage they considered undesirable. A clergyman who performed an illegal marriage could be transported for up to fourteen years. Yikes! This act also applied in Wales and Ireland. However, it did not apply to Scotland which was under its own legal system and where the age of consent was 12 for girls and 14 for boys. Hence marriages at Gretna Green became popular. It was not the only Scottish Border village destination, though it was the first village over the border on the main west coast route from England. It was not the closest place if you went north from London. If you went up the Great North Road to Scotland, it would take you to Coldstream Bridge or Mordington or Lamberton Toll, all on the eastern side of the country. Moreover, marriage records show a number of Irish couples married in Scotland to thwart the Irish marriage laws. Gretna Green was not the most popular venue for the Irish, however. Instead they headed for Portpatrick in Wigtownshire on the far west coast because there was a daily packet boat service from Ireland to that village. Finally, the eloping couple didn’t necessarily need to go to Scotland at all. The Channel Islands and the Isle of Man also allowed for clandestine marriages before their laws were changed. One had to be absolutely certain they were in Scottish territory when the marriage took place. The Berwick toll keeper, who usually presided over the weddings for those who crossed into Scotland there, was sent to prison for performing a ceremony in Berwick town itself, which was in England. Under Scotland’s irregular marriage traditions, anybody could perform marriages whether they were farmers, the blacksmith, the toll masters, the landlord of the local tavern, a passing highwayman or a local smuggler. So, contrary to the common tradition of “anvil priests,” the blacksmith was not the only person who could marry a couple. After reading this, I began to wonder if I would actually feel married if the ceremony was performed by a blacksmith, much less a highwayman or smuggler! How binding would that seem? I would love to hear your views on the subject. I had new covers created for my books, “Fitzwilliam Darcy An Honourable Man” and “Mr. Darcy’s Forbidden Love” and in celebration, I am giving away a Kindle e-book of each. Just leave a comment to this post by Midnight Friday (CST) if you would like to be in the drawing. 75 Responses to Off to Gretna Green and a giveaway! That painting, “The Elopement” by John Collet, is so cool! The new book cover are beautiful!! Well done, you. The marriage laws were necessary, but I wish the property laws could have been changed as well, so that parents and guardians would have been able to put restrictions on the heiresses, so that any marriage had to be approved in advance by the parents or guardian or else no money would go to the husband. No more kidnapping young girls for their money! What scoundrels those cads were. The new covers are lovely! Thank you for the Grenta Green post. Very interesting! Thanks for the info regarding marriage and elopements. Very interesting! I can’t imagine getting married in a ceremony performed by a highwayman or a blacksmith. It just wouldn’t feel “right”, ya know? Total mixed feelings about Gretna Green: a place for lovers to get married or a place where you do the craziest thing of your life against what it is supposed to be the “wise” people that surrounds you? Brenda I enjoy reading up on Greta Green I have to say I’d not feel married by a Blacksmith or actually anywhere other then a Church. Thank you for that information, it helped me answer the question of why? Now about consent at 12 or 14…wow! So, if these marriages are legal, how can it be possible for someone to be disinherited? And how does one go about disinheriting someone? Love your stories and your blogs! Thank you for sharing them. I suppose the Scots could marry at 12 or 14, just not the English. 🙂 And as for disinheritance, that may be those that were inheriting by virtue of a will that could be changed. The inheritance by entailment could not be changed, or that is my understanding. So happy you said that you enjoy my stories and the blogs. It makes me smile.